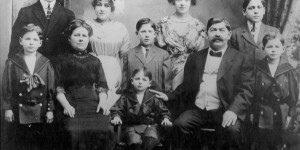 My family, the Heppses, were amongst the first Jewish families in Homestead. My great-grandfather, Bernhardt (1895-1949), was the first to come around 1888 from Hungary. He went back to Hungary in late 1892 to marry my great-grandmother, Berthe (1871-1957), and soon after they returned, his brothers Samuel and Adolph arrived with their families. 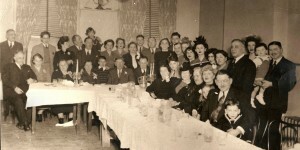 In the early 1900s they brought over their five half-brothers and sisters, all of whom began their American lives in Homestead, and at least three of whom became members of the congregation — Alex L. (Sandor) Hepps, who was the head of the Chevra Kadisha; Fannie Keizler, mother of E.A., who was president of the congregation in the late ’30s; and Frank Hepps. From the beginning until the end, Heppses were active in the synagogue. Bernhardt and Samuel were charter members — Bernhardt the first Vice President — and Adolph joined soon after, and both he and Samuel were officers in the early years as well. Bernhardt chaired the synagogue’s building committee for both the first and second synagogues, and his sons and grandchildren served in leadership roles as well, including son Samuel, who was secretary in the early ’30s, and grandson Morton Keisler, who was secretary in the early 1950s. Morton’s brother, Bernard Keisler, attended minyan at the synagogue until it closed. The pictures I’ve uploaded so far are of Bernhardt’s part of the family. Click on the first one to view the whole slideshow. 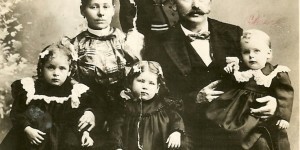 Back row: Abraham C.; Middle row: Berthe and Bernhardt; Front row: Olga, Hazel, and Jacob (Chick). Jacob was born in December 1896, hence the estimated date of 1898. Back row l-r: A.C., Hazel, Olga, and Jacob (Chick). Front row: Martin (or Herbert), Bertha, Samuel W., Bernhardt, and Herbert (or Martin). Seated: Maurice. The twins were born in 1904 and Maurice in 1907, which is why I think this picture was taken ~1913. Taken in December 1942, this picture shows Bernhardt & Berthe with their children and grandchildren, as well as their siblings. ← The Homestead Rodef Shalom Congregation Bomber? !